Why See Mark Morris Dance - Pepperland? The sonic genius of The Beatles meets the kinetic mastery of Mark Morris' creative vision in Pepperland, a tribute to the Fab Four's iconic 1967 album Sgt. Pepper's Lonely Hearts Club Band. The critically lauded choreographer, often hailed as one of the greatest and most influential modern dance leaders of our time, brings his kaleidoscopic tribute to stages across North America as part of the groundbreaking masterpiece's 50th Anniversary celebrations. Not content to simply choreograph the album, Morris commissioned a brand new score from avant garde composer Ethan Iverson, setting his electric movement to six bold reinventions of its original songs. The company is joined on stage by an unorthodox chamber ensemble of voices, soprano saxophone, keyboards, percussion and the psychedelic-sounding theremin who conjure vaudeville rhythms, haunting piano reveries and hypnotic melodies. The music meets a vibrant visual cue in the dancer's explosively complex dance patterns and breathtaking abstraction. Dressed in loud neon, bright suits and miniskirts, they effortlessly evoke the colors of Carnaby Street, Woodstock and the summer of love, bringing together the experimental with the warmly nostalgic in a dazzling fusion of old, new, familiar and alien. 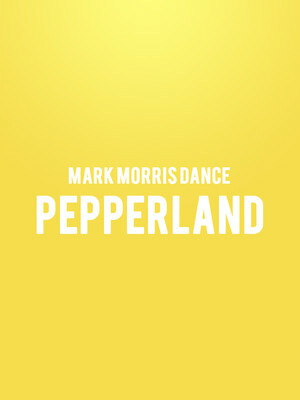 Seen Mark Morris Dance - Pepperland? Loved it? Hated it? Sound good to you? Share this page on social media and let your friends know about Mark Morris Dance - Pepperland at Segerstrom Hall. Please note: The term Segerstrom Hall and/or Mark Morris Dance - Pepperland as well as all associated graphics, logos, and/or other trademarks, tradenames or copyrights are the property of the Segerstrom Hall and/or Mark Morris Dance - Pepperland and are used herein for factual descriptive purposes only. We are in no way associated with or authorized by the Segerstrom Hall and/or Mark Morris Dance - Pepperland and neither that entity nor any of its affiliates have licensed or endorsed us to sell tickets, goods and or services in conjunction with their events.